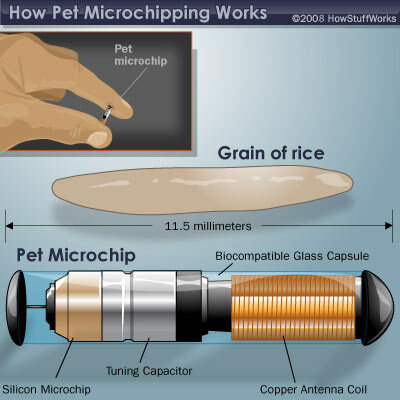 Basically a microchip is a small, scannable chip about the size of an uncooked grain of rice. The microchip has a unique id number attached to it that, once called in, will provide all the contact information of the animal’s owner. Every stray facility and police station has at least one scanner so if they come across a stray animal, they will check for a microchip. I definitely recommend microchipping to anyone with a companion animal. The process of putting the chip into your pet is very easy and rather painless. The chip is inserted under the skin of the animal, between the shoulder blades, with a needle. There rarely is blood and I have yet to see an animal react to the procedure. Once the microchip is inserted, it may move a few inches but you will probably never be able to find it/feel it. You will then have the unique id number registered to you with all your contact information. Remember to always update this information as time goes on and you move, change your phone number, or get a new email account. If the information assigned to the chip is no longer valid, the whole thing is pointless because no one can contact you. Many people with dogs are willing to get a microchip because they can easily see how it is helpful. However, some cat owners do not think it is necessary to get a microchip for their indoor cat because it lives inside 24/7. I would argue that this is actually why you would want to microchip your cat because they will get lost very easily if they ever make a great escape to the outdoors. Less than 10% of cats are reclaimed at shelters – if you microchip your cat and it ends up at a stray facility/police station/animal shelter/vet clinic they will all know to scan for a microchip and will then be able to find you, the owner. Microchipping is fairly cheap (about $20-$35). Contact your veterinarian or local shelter if you are interested in getting one for your pet! This entry was posted in Blog Posts and tagged cat, dog, microchip, stray. Bookmark the permalink.